There's a well-circulated 'factoid' that Argentinians consume 70kg of meat per head every year. It's the sort of thing that sounds apocryphal. I mean, 70kg? That's 154lbs. That's 11 stone of meat. That's, what, two Justin Biebers? It can't be true, you think. And then you sit down to lunch in Buenos Aires and you start to see that, actually, it's very, very possible. Having flown overnight, we took the advice of friends who are seasoned annual visitors to Buenos Aires: namely drop your bags, have a shower and go straight out for lunch at La Cabrera, one of the city's most celebrated parrillas (a traditional restaurant with a charcoal grill). My wife ordered the ojo (rib eye), I ordered the lomo – tenderloin, basically, a cut we don't really offer in the UK, but I'm told it's sort of sirloin-meets-fillet. I don't recall being asked for a cooking preference, but that could be hazy, jet-lagged memory, or it could be that, well, this is a country that simply knows steak. We had found some instructions on ordering in a guide book but swiftly adapted them thus: "If you don't specify, your steak will be cooked a punto (medium). To get it pink on the inside ask for jugoso (medium rare). Vuelta y vuelta or poco cocido means rare, and "well done" will, we suspect, get you deported. Regardless, what arrived was superbly cooked: a deep, caramelised-rather-than-charred brown on the outside, deep purple within. It was also about an inch deep and perhaps five inches in diameter. Here's the thing though: there were four such slabs of beautifully cooked cow in the portion. Welcome then to Argentina, where suddenly 70kgs per capita seems like it might be a bit of an understatement. The thing that really strikes home though? That simplicity. Yes, La Cabrera's USP is that everything comes with a vast array of side dishes, from creamed corn to roasted garlic, to salads, mashed aubergines and some 14 other tiny bowls of things. But the meat? Salted and grilled. That's it. There's no marinating, no slow-cooking, no smoking, no basting in sauce. 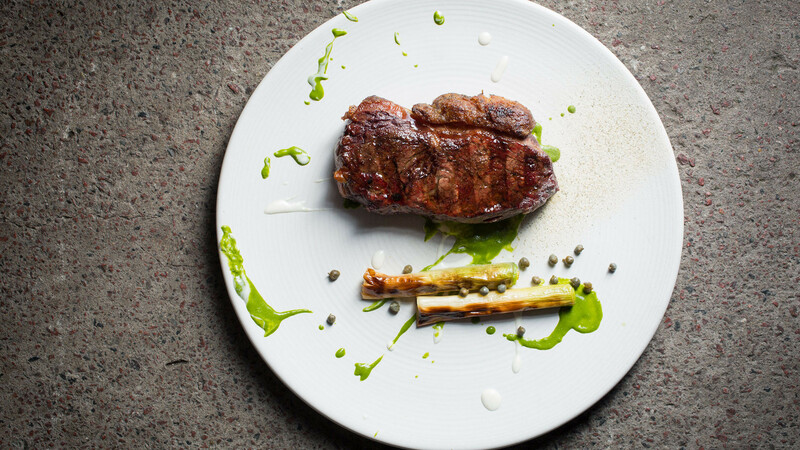 What's on the plate is barely diluted, well-aged cow in all its beefy glory. 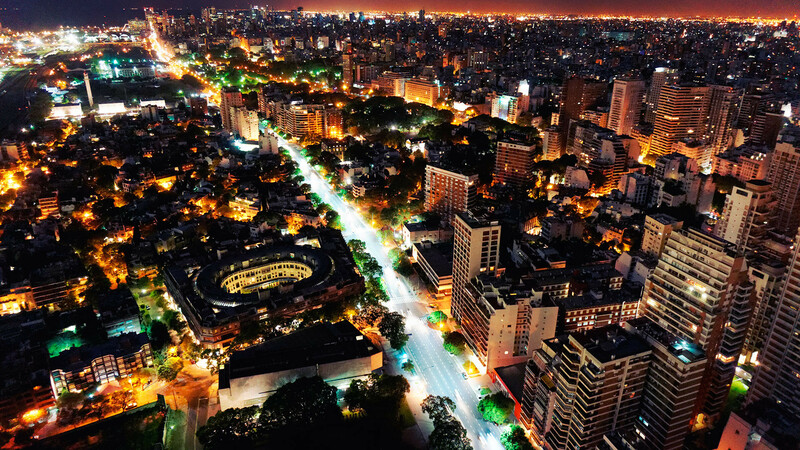 The philosophy also extends – pretty much – to every other dish we try in Buenos Aires. There's a delightfully straightforward, snobbery-free attitude to food at all levels, and what appears to be a very happy adoption of international cuisines and restaurants. Some get their own unique Argentinean twist – most notably pizza, which here has around a 70:30 cheese:bread ratio that is, obviously, utterly delicious – but, generally, the mantra is "less is more." "Argentina has an abundance of cheap and good ingredients," explains chef Saul Gerson. "You don't have to work too much to have a decent meal." Saul runs El Arte de Amasar (elartedeamasar.com), a cookery school, from his home in Buenos Aires. "I'm always trying to make the best meal out of the fewest ingredients," he explains, and has a particular bias towards making dishes lighter and healthier but – are you reading, Deliciously Ella et al? – without compromising the true flavour. We're there to make empanadas, a dish that Saul points out is "traditionally said to be eaten with the legs apart because they drip so much fat." His version still uses lard in the dough –"lard is the best," he says – just less of it. The resulting pastry is superb, soft, light, but with texture and density, although the comparative healthiness of the results is slightly undermined by their moreish nature – I have to push the plate out of arm's reach after inhaling four – but at least our clothing is never under threat. Perhaps the greatest lesson in simplicity though comes in Mendoza at 1884, Francis Mallmann's celebrated restaurant. Before the Netflix Chef's Table documentary gave me a full-blown man-crush, I already had a moderate obsession with Mallmann since I picked up a copy of his recipe book Seven Fires a few years ago as part of my research for another story. Think smaller pasties, with a finer, shorter pastry. De carne are stuffed with spiced beef and egg, queso cebolla with cheese and onion. Basically two round biscuits with a dulce de leche filling, sometimes dipped in chocolate, and available pretty much anywhere you’d expect to buy a snack. The Cachafaz brand is pretty ubiquitous, but I preferred the ones from Havanna, a chain you’ll find everywhere from high street to Buenos Aires airport. Comes with a thicker bread base than you’ll be used to but even then, it will still be utterly swamped in squidgy melted cheese. The Argentine classic is the fugazetta – all of the above plus a thin layer of onions. Like the chefs kept telling me, proof that less is definitely more. A gelato-style ice-cream, proving that the Italian influence also extends to dessert. There are ice cream shops – chains, and independents – all across Buenos Aires, my favourite of which was Nicolo Helado in Palermo. Forget the cronut, this is the croissant variation you want. Smaller, stickier, sweeter… Available from panaderías and in cafes everywhere. To appreciate Mallmann's vision and dedication, you need to see it on home soil. And, while the man himself tends to focus on larger-scale events these days, he's left 1884 in the very capable hands of Dan Alterman, a hospitable man who probably soon regrets telling me I can hang out around the cooking area for as long as I want. "It's not 'seven fires' here," explains Dan with a grin, "it's 'three'. We do the 'seven fires' thing elsewhere for bigger dinner parties and celebrations but here, we're a restaurant, so we have to watch the economics." Things may be scaled down but oh, the three they have… On the right is a hugely impressive wood-fired oven, on the left a classic parrilla (alongside a huge stack of charcoal that is gradually called into service throughout the night) and, in front, a pit that's: a) Mallmann's own invention; and b) the single sexiest piece of cooking kit I have ever seen. There are grill sections, there are hotplates, there are logs burning in the centre and a shelf some six feet above the fire –"we butcher the evening's meat in the afternoon and rest it on that," Dan reveals, "so that the fat picks up a little smoke." Sauces bubble away, potatoes are kept warm in a thyme-heavy, wine-based sauce and, over a few burning charcoals brought over from the parrilla, there's a selection of vibrant but very charred vegetables that will shortly have me questioning much of what I thought I knew about cooking. Or, indeed, overcooking. The star, though is, of course, the beef. "Argentine cuisine is very much influenced by immigrants," explains Dan, "especially from Spain and Italy, but for grilling we take our own influence, from the gauchos. It's that strong connection with fire – whenever there's a fire you stare at it, and you're drawn close to it. Dan echoes Saul's earlier statement that simplicity is the key. 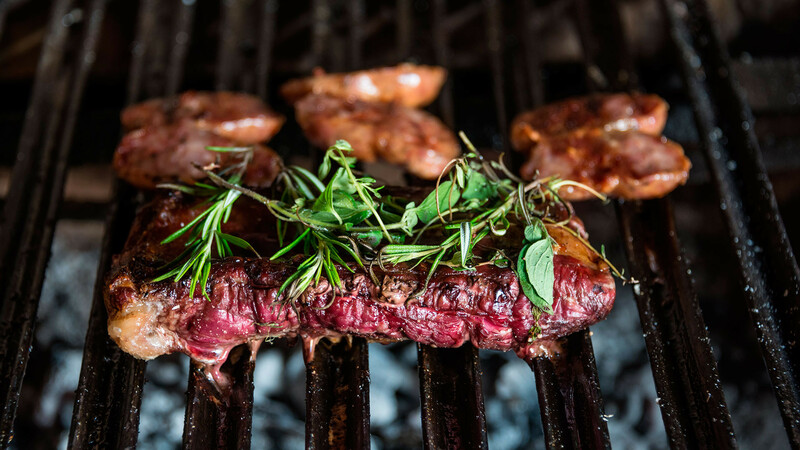 "I always say the hardest part of my job is finding good ingredients" explains Dan, "because the way we grill is also influenced by the quality of the meat. We don't need to brine it for days to make it tender or tasty. It already is." 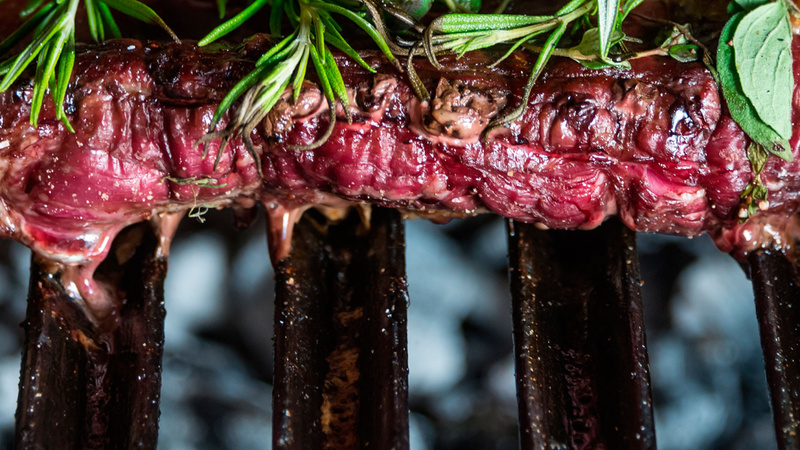 There is no great secret then to grilling the Argentinean way. You could say less is more, and you'd be right. I just prefer the way Dan puts it. "It's meat, salt, fire and time," says Dan. "You don't need anything else."